Secure™ Spiral Wrap is a unique and simple solution for bundling and organizing cables in a hassle free, efficient way. Primarily used in the Audio/Video field Spiral Wrap is a necessity for any project that you see fit. 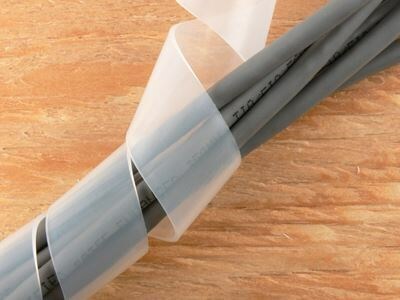 Available in clear or black polyethylene Spiral Wrap makes bundling cables easy and attractive. From sound and security cable runs to simply organizing a mess of cables behind your computer; Spiral Wrap is a must have. Aesthetically pleasing and extremely easy to use you can bet that Secure™ Spiral Wrap will fit your every need. Secure™ Spiral Wrap comes in diameters from 1/8 inch to 1 inch in 100 Foot Lengths. Max Bundle Diameter 3/4 - 5"